The skin is the human body’s largest organ, and it is quite amazing. It is durable, regenerative, and can handle the wear and tear of everyday life. However, it is not immune to infection and disease. Autoimmune diseases, such as psoriasis, can affect the skin, causing raised, red, scaly patches to appear on the surface of the skin (Psoriasis.org). Although psoriasis may appear similar to eczema or other skin rashes, it is differs in that it will not go away with over-the-counter medications. An autoimmune disease causes an internal imbalance, so typical medications that treat skin rashes will not heal psoriasis. To treat psoriasis, seek the advice of a physician who will be able to diagnose the raised, red patches by their characteristic well-defined edges. With the help of prescription medication, psoriasis can improve. The severity of psoriasis will vary significantly. It varies from mild to severe, where less or more parts of the body may be affected. Additionally, there are multiple types of psoriasis, all with distinct characteristics. When one type of psoriasis clears and another form appears, it is most likely in response to a trigger. Everyone is unique and will not react to the same conditions in the same way. Some things may cause one person to have a psoriatic breakout, whereas another individual will not react at all. Some triggers to look out for if you have been diagnosed with psoriasis are stress, skin injuries (sunburns, vaccinations, and cuts), as well as certain medications (Lithium, Quinidine, Inderal) and infections such as strep throat (The National Psoriasis Foundation). 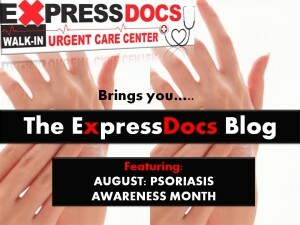 If you are having a flare up and need immediate assistance from a physician, walk in to ExpressDocs Urgent Care Center.